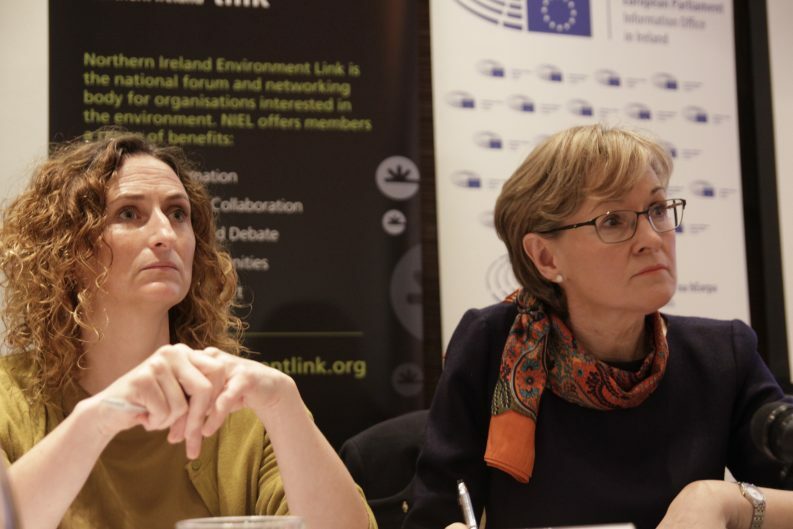 A Sinn Féin MEP has criticised her Fine Gael counterparts for voting against amendments to ramp up EU emissions targets in the bloc’s proposed climate strategy. Last Thursday, MEPs voted in favours of a non-binding resolution for a more radical climate strategy that would boost the bloc’s 2030 emission reduction target to 55 per cent compared with 1990 levels. Last October, the UN’s Intergovernmental Panel on Climate Change published a special report, finding that the EU’s current targets do not line up with the urgency of action required to curtail global temperature rise to 1.5°C. A total of 369 MEPs voted in favour of the overall resolution, including all four Fine Gael MEPs. An analysis of voting records on specific amendments, however, reveals that they voted against key amendments, including one to increase the 2030 emissions reduction target. The four MEPs also voted against a 100 per cent renewable energy scenario in the Commission’s climate roadmap to 2050 and against an amendment for the EU to include the fight against global warming among its fundamental values. Several of the amendments were raised by MEP Lynn Boylan who said she was “appalled” by her Fine Gael colleagues’ decisions, including voting against an amendment to embargo new oil and gas exploration permits. “I am appalled but in no way surprised at how my Fine Gael counterparts voted on [last Thursday’s] climate resolution,” she said. “They voted against a 100 per cent renewable-based energy strategy, against boosting the EU’s 2030 climate target to 55 per cent, and against asking the EU to phase out fossil fuel subsidies,” Ms Boylan continued. “The debate clearly showed where interests lie on climate change and how liberal and conservative political ideologies clearly cannot go hand in hand with the rapid, far-reaching and unprecedented climate action we need,” Ms Boylan said. She expressed satisfaction that the new climate resolution was finally ratified despite, what she called, the lobbying of right-wing groups to dampen “climate ambitions at EU level”. In a statement to The Green News, the head of the Fine Gael delegation in the Parliament, MEP Seán Kelly, said that, while he is “strongly in favour of ambitious efforts” to tackle climate change, now is not the appropriate time to “revise the ambition levels for 2030”. Mr Kelly, who expressed his support for student climate activists at last Friday’s climate strike, said that the mid-term review of the climate stratgey would be the best place to re-examine the EU’s target. Accepting the proposed 55 per cent target would mean that all other targets that were recently set would have to be revised and would “bring about uncertainty, particularly to our industrial and agricultural sectors”. While welcoming the idea of climate action as a fundamental value in principle, Mr Kelly said that such a move would require treaty change and that now was not the appropriate time to do so. In terms of oil and gas exploration, Mr Kelly said that individual Member States have “sole competence and responsibility” for choosing their energy mixes to meet their climate targets and ensure security of supply for their citizens. Mr Kelly said that a more suitable timeline to hit 100 per cent renewables is the end of the century as “some level of gas will be required in combination with renewables” until at least 2050. In 2016, Mr Kelly was appointed as the European People’s Party (EPP) spokesperson for Liquefied Natural Gas (LNG) and has voiced his support for the now-stalled Shannon LNG project in Co Kerry. MEP Brian Hayes told The Green News that his views are “well represented” in Mr Kelly’s reply. MEPs Mairead McGuinness and Deirdre Clune did not reply to requests for comment at the time of publication. Ms Boylan also lamented what she described as a “Brexit chaos” that “smothered” media coverage of the presence of 60 young climate strikers who watched the climate debate in the Parliament last week. The young climate strikers, including 16-year-old Saoi O’Connor from Cork, outnumbered MEPs in the chamber, watching lawmakers deciding on their future from the public gallery. The young campaigners were invited to observe the climate debate by a group of MEPs including Ms Boylan. The EPP and the Alliance of Liberals and Democrats for Europe groupings, to which Fine Gael and Fianna Fáil belong respectively, previously vetoed a proposal to invite pioneering teenage climate change activist Greta Thunberg to addrress lawmakers. Ms Thunberg, who holds a climate vigil outside the Swedish Parliament every Friday, has inspired students across the world to engage in similar acts of civil disobedience. Last week, she was nominated for the Nobel Peace Prize. Students from across the world walked out of their classes to participate in the global strike to demand rapid, meaningful action for tackling climate change from their governments. The protests included thousands of Irish students packing the streets of Dublin, Cork and other towns and cities across the country to rebuke the State’s failure in tackling climate change to date.